Thanks, Mail Carrier | Available Today: Disney's 101 Dalmatians Diamond Edition Blu-ray Combo Pack! Available Today: Disney's 101 Dalmatians Diamond Edition Blu-ray Combo Pack! While there will forever be new movies released into the theaters or onto Blu-ray that gain attention and amuse fans, there is no doubt that it takes more than that to be considered a classic. After all, it isn't just some computer graphics and a simple storyline that create a film that will delight generation after generation after generation! The one name that knows that all too well is the one and only Disney, and today they are releasing one of the absolute classics so that families everywhere can unleash the excitement and suspense again and again: Disney's 101 Dalmatians: Diamond Edition Blu-ray Combo Pack. 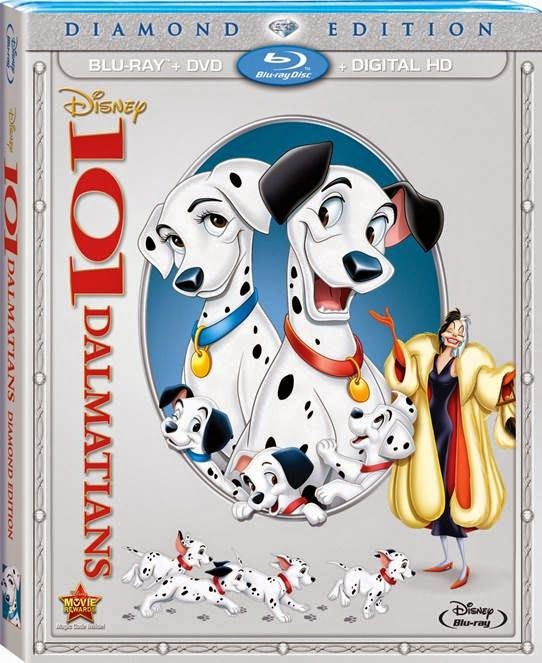 Now available for the first time ever on Blu-ray Combo Pack and Digital HD, Disney's 101 Dalmatians brings viewers along with Pongo, Perdita and their super-adorable puppies as they experience thrills, hilarious spills and an epic action-packed adventure when they face off with Cruella De Vil, Disney's most fabulously outrageous villainess. When Cruella dognaps all of the Dalmatian puppies in London, it's time for brave animal heroes to launch a daring plan to save all puppies from her clutches! While I was initially concerned that my kids might be a little scared by Cruella, the overwhelming cuteness of all of the puppies won them over and ensured that they didn't mind this villainess one bit! New Animated Short - The Further Adventures Of Thunderbolt - pick up the action where the movie left off in the pups' favorite show. DisneyView - expand your viewing experience and more! Whether you're a fan, a collector or are new to the tale of 101 Dalmatians, this is one combo pack that you're going to want to add to your collection and share with your family time and again! Disney's 101 Dalmatians: Diamond Edition Blu-ray Combo Pack is available now in stores near you, from Disney or on Amazon. You can also stay connected and keep up with all things puppy by connecting with 101 Dalmatians on Facebook, their website and the Disney Movies Anywhere app. Want to get in on the action and fun even more? Disney has released a fantastic collection of behind-the-scenes materials so that you can join in the dalmatians excitement in multiple ways. Simply click on the image below to download a variety of fun facts including how many spots are in the film, how Xerox was introduced to the animation process, the extraordinary color styling of the film, a How-To-Draw Cruella De Vil by Master Animator Andreas Deja, and MORE! Other than 101 Dalmatians: Diamond Edition that I was provided, I was not compensated or enticed to do this review in any way. This post is solely my honest opinion about this product. I remember when this came out in theaters (makes me feel very old). Fun movie. The new BluRay movie for 101 Dalamtions looks great and there will be more detail to see this movie better. I would love to own this movie, it is a classic. I loved this movie when I was a kid and my family loves it too! Glad they are doing a reissue! This is one of my all time favorite movies as a kid. I was so excited about this coming back out I rushed to pick a copy up! Already watched it. This is such a fun movie. Glad they're releasing it for a new audience.